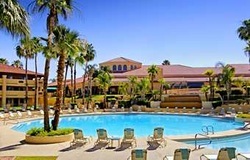 The beautiful resort located in north central Phoenix with easy access to I-17 in the central corridor. Relax by our outdoor pool and let your cares drift away and enjoy delicious dining from morning to night. Start with our cooked to order breakfast or sample authentic New Orleans cuisine at our hotel's Lafitte's restaurant; the menu is full of Louisiana favorites and the desserts are absolutely irresistible. Every evening, visit our Manager's Reception for cool drinks and warm company. This nightly event is the perfect start to your night in Phoenix. 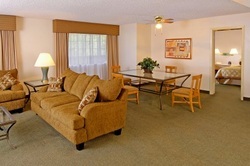 At the end of the day, you'll be able to relax in our spacious hotel suites. 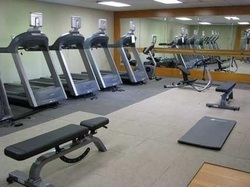 As the pictures in our photo gallery show, our hotel is all about your comfort. We look forward to taking care of you soon at the Embassy Suites Phoenix- North hotel. The Embassy Phoenix North Resort is the Perfect place to enjoy a exquisite and affordable venue for a Banquet style reunion. The following banquet dinner option includes a professional DJ, Photographer, Class Website, Facebook Reunion Community Page, Classmate Name Badges, Door Prizes*, On-Site Reunion Coordinator, and much more. Classmates can choose from one of the following entrées: Slow Roasted Prime Rib of Beef - Hand carved and served with Au Jus and Horseradish, baked potato and seasonal vegetables; or, Honey Sesame chicken - Breast of Chicken dipped in honey sesame batter and sautéed to perfection, topped with an apricot glaze, roasted red potatoes garnished with rosemary , and seasonal vegetables; or, Salmon - Pan seared salmon fillet with a balsamic port wine reduction, wild rice with mushrooms, and seasonal vegetables. All Dinner entrée selections are served with a fresh garden salad - selection of dressings, warm rolls, whipped butter and dessert.